As any vanquished opponent might tell you, the Slivers can prove most resilient in any number, and the same can be said for the tribe as a whole. Most other popular, enduring tribes in Magic are part of the common folklore and mythos- Goblins, Elves, Merfolk. 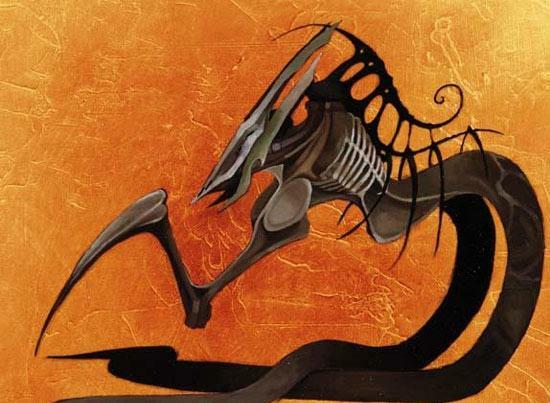 While other creature types have had some endurance throughout the years (see our history of the Kor here), it can be argued that few have fared as well as the lowly, unassuming Sliver. 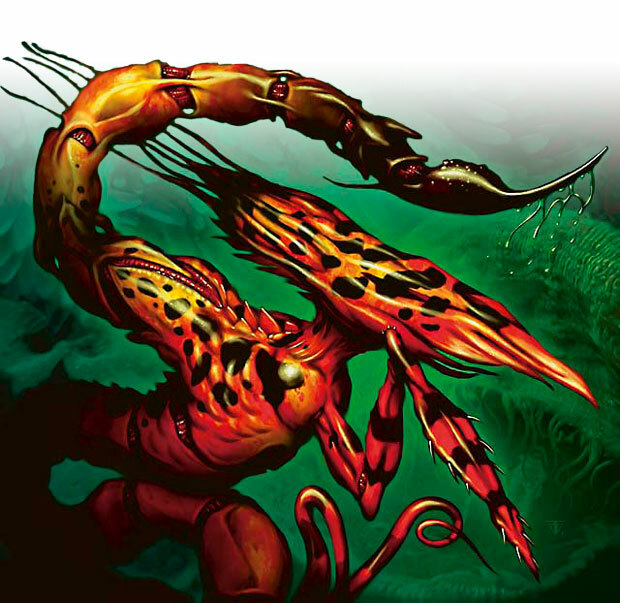 The first Slivers appeared in 1997’s Tempest, and shared the same characteristics: they were all mono-coloured creatures, and they granted either a passive or a two-mana activated ability. The only exception to this was the Metallic Sliver, a 1/1 artifact creature which had no abilities of its own. This anomolous Sliver, according to lore, was the creation of Volrath, the Evincar of Rath, and was designed to be something of a mole in the Sliver colony that resided beneath the Stronghold. And speaking of, 1998’s Stronghold set gave a second set of Slivers, this time with a new twist- every Sliver is multi-coloured, one for each allied-colour pairing. This set also introduced the Sliver ‘lord,’ the Sliver Queen, Magic’s first five-colour card. Thanks to her inclusion on the much-maligned Reprint List, she was not available for inclusion here, but her successor- the Sliver Overlord– fills the general’s role (as a ‘Mythic Rare,’ no less). From there, the Sliver’s were written out of the story for another five years, not making a comeback until Legions returned them in a big way. A full 15 Slivers were introduced in this small-set (compared to 17 in all of Tempest block), though it was something of a one-shot. The following set, Scourge, offered the aforementioned Overlord and nothing more. Still, the Slivers had cemented a reputation for themselves, fun for both casual and even competitive play, and Wizards wouldn’t wait nearly so long to tap into that vein of popularity again. 2006’s Time Spiral block seemed to feel that if a dozen-plus Slivers was a good thing and moved a lot of cards, why not print dozens of Slivers and move a ton of cards? A total of forty-three Slivers were printed during this time, for virtually every keyword of effect imagineable. It just might have been overkill. Still, it all ensured that when the designers of the first-ever Premium Deck Series deck sat down to brainstorm, they had no shortage of resources to choose from, and undoubtedly the past popularity of the species was thought to make a good theme. What better way to improve the chances of the new concept succeeding than to mate it with one that had proven so popular in the past? This proved something of a miscalculation, as the sales for the Slivers decks were rather less than hoped (indeed, they can easily be found even now for around $20), but it certainly wasn’t enough to bury the concept as the release of Fire & Lightning earlier this month proves. So it’s in that context that we take a look at The Slivers to see how it performs as a deck overall. The foiling is nice, though nowhere near as nice as this year’s model, but how well is it constructed? Fittingly, the deck packs in more than its fair share of Slivers. With so many of the creatures having spell-like effects, and needing as many as possible to be deployed together to get the maximum benefit, the deck’s designers saw little point in taking chances. A full 50% of the deck is creatures, and all but one of these (the Amoeboid Changeling) is a Sliver. After lands, that leaves room for a paltry handful of noncreature spells, but that’s not necessarily a bad thing. Ordinarily this would get flagged as a cause for concern, but as Slivers (like many Zendikar-block Allies) generally get better with each additional Sliver on the field, you’ll soon find them a bargain if you have enough of them out. Additionally, with the deck being a one-trick pony (smash face with Slivers), having the ability to squeeze so many out in the early game is vital for the deck’s success. Indeed, The Slivers is well-equipped for the early game. There are only four one-drops: a pair each of the Metallic Sliver and Virulent Sliver, the latter equipped with the Poisonous keyword for a variant of the deck’s sole win condition. Beyond that, however, the options blossom. The Stronghold Five are repreinted here, and they are some of the best of the bunch. While the Spined and Victual Slivers are a bit underwhelming, the Acidic Sliver is a very solid quasi-burn option and the Crystalline Sliver makes nearly all removal in your opponent’s deck become dead cards. The Hibernation Sliver is a bit middle-of-the-road, but useful to permit you to attack with key Slivers (rather than holding them back worried about their being lost in combat). With few exceptions, the Slivers presented here are singletons, which makes for a very unpredictable (albeit fun) game, but the Muscle and Gemhide Slivers are two-ofs. The Muscle (which we’d really want a full playset of) beefs up your Slivers across the board, while the Gemhides are included for mana fixing/ramping. Another Sliver that would be far more potent in multiples is the Winged Sliver, but alas it is not to be. Instead we get cards like the Frenzy and Clot Slivers, which are far weaker for their cost. Rounding out the two-drops are the Quick Sliver (useful to allow combat tricks and subtlety in a deck lacking much of either), the Heart Sliver (so-so), and the Amoeboid Changeling. The Changeling’s sole virtue (aside from being considered a “Sliver” itself) is its ability to turn other creatures into Slivers. This may not seem like much, but paired with the Sliver Overlord’s ability to permanently steal Slivers from your opponent, it’s a measure-too-clever combo builder. We’d have preferred a little more consistency up the middle. On to the three-drops, the song remains much the same: little repetition of strong Slivers in favour of a “variety pack” approach with mixed results. The Barbed and Armor Sliver provide Power- and Toughness-boosting, respectively, which makes for a nice little mana sink for later in the game when your hand is empty. That said, both are much weaker than the Spectral Sliver, who pumps both at the same cost. To be fair, the designers did put in two, but cutting the Armor and Barbed in favour of rounding out the set of Spectral would only strengthen the deck. The Homing Sliver is a somewhat cutesy way of getting the right Sliver at the right time, while the Necrotic is one of the strongest in the game and an answer to every permanent, from land to creatures to planeswalkers. Another card that really wanted to be a four-of, the deck makes do with one. There’s a single four-drop card, the Fungus Sliver (trading on the Fungusaur mechanic), while the deck tops out with a quartet costing 5+ mana. There is, of course, the aforementioned Overlord, which is a powerful beater even without its extra abilities (and the Black in its mana cost makes it that much harder to kill). The Might Sliver is a pumped-up version of the Muscle Sliver, and isn’t the worst deal on its own (five mana for an effective 4/4). Lastly, the Brood Sliver and Fury Sliver act as solid closers, giving you either an army of Slivers to overwhelm your opponent with (though the deck positively begs for an Overrun effect, it doesn’t have one) or potentially doubling their damage. All in all, a fairly mixed bag, and as mentioned above the noncreature support is miniscule. The good news is, each are solid options you won’t feel upset drawing at nearly any point of the game. The Coat of Arms is the classic tribal-pumper, and is a natural fit here. The Heartstone lets you stretch your mana (33% of your deck’s creatures have activated abilities that cost mana), and although less useful it does have its place. The remaining three are there to grant you card advantage, either from the top of your deck (Distant Melody), inside your deck (Wild Pair, aka ‘Timoon and Pumbaa’), or the graveyard (Aphetto Dredging). Since The Slivers is effectively a swarm deck, it has the same weakness all such decks do- before long, you’ll often find yourself playing from the top of your library. Although few, these options go some way in mitigating that. Of course, this is no ordinary swarm deck, it’s that most unusual of breeds: the five-colour swarm deck, almost a contradiction in terms in some ways. There’s some help there, however, with a full eleven different nonbasic lands to help smooth your mana base, and with a higher-than-normal consistency. A singleton Rootbound Crag leads the pack, but beyond that it’s a veritable Noah’s Ark of lands: two each of Rupture Spires, Terramorphic Expanses, Ancient Ziggurats, Vivid Creeks, and Vivid Groves. Again in the case of the Ziggurats, we see less copies than we’d like for the good of the deck (there should be four here). You have to wonder about the weakening of the deck. In Duel Decks, there is some deliberate tweaking of power levels needed to strike the right competitive balance, but what is The Slivers tuned to face? If you’re going to be asked to pay $34.99 for a deck (foil or no), greater care really should have been paid to some of these easy choices to strengthen it. Nor can the “intro pack” argument be used: that there are deliberately weaker cards included to give the aspiring deckbuilder places to easily improve and build their skills. It also would reduce the overwhelming variance the deck has, and give you something a little more consistently competitive. Mindful of these shortcomings, we’ll be taking the deck into battle and reporting back in two days’ time. Join us then! Well, since no one has commented, perhaps that proved my point. Slivers might be an interesting game mechanic, but it may lack the draw of other mystical creatures that players are already familiar with. It’s hard to be drawn to a group of creatures without a focus. Maybe a creature character or planeswalker centered around Slivers would generate more interest. Then again, I hear the Slivers are popular, so it may be that I don’t like them personally. 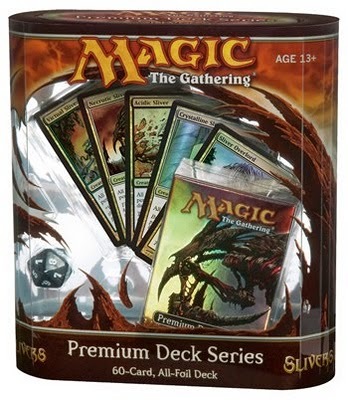 If you’re not sure what the Slivers actually are, follow this link: http://en.wikipedia.org/wiki/List_of_species_in_Magic:_The_Gathering#Sliver. 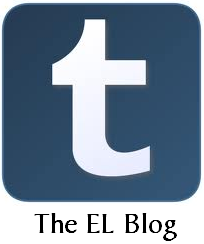 This post has only to do with flavor and storyline and nothing to do with game mechanics. But when you’ve been around since the game’s creation, you tend to enjoy the flavor of the game as much as actually playing the game. In short, they were introduced with Tempest and Stronghold, then made two different combacks in later sets, which had a stroyline theme. You’re right, they’re entirely indigenous to Magic and as such have no deep reservoir of sentiment to tap into, unlike some of the more traditional fantasy races and archetypes, but like anything else it’s in the eye of the beholder. For me personally, Tempest is the all-time best set, so there’s a bit of a soft spot in my gaming heart for this particular tribe. Players who like a narrative, and who weren’t playing during the three blocks the Slivers were featured in, will probably find them a bit less appealing. Of course, their rather unique mechanic always finds its adherents! On one hand it featured the shadow mechanic which made the set as self-contained as the Kamigawa-Block is. Whereas the one deals with creatures unblockable unless the opponent plays along the same road, the other one meddled with spirit and arcane stuff. On the other hand, being the set that marked my entrance to the Magic universe I absolutely agree with you on being one of the top sets ever created. I guess you won’t object when stating that there was nothing up to now that came even close in terms of flavor. There was a great background story about Gerrard, his ship, the Wheatherlight, and his crew which was told in those little comic-style books featured in the tournament packs. In a plot that aligned many kinds of fantasy archetypes a hero and his fellowship embarked on a mythical quest that lead them through a perilous realm full of strange encounters. Since when is Amoeboid Changeling not a sliver? Wouldn’t that be the same thing as calling Clone (M11 card) a Sliver as well? It’s all things to all things, since it is a mimic card. Good grief, Troacctid, don’t you have *anything* positive to say?